Why it's awesome: this Hungarian music video is shot in Budapest 💖 plus it's catchy - you'll be able to properly pronounce ne is figyelj rám (do not listen to me) in no time! #useful We love the guitar melody and it kind of sounds like British Indie music - it's the bass. The intro reminds me of Franz Ferdinand!! Thank you Sári for the recommendation! Why it's awesome: Lush voice (and face) plus the guitar reminds us of George Ezra (is George a Hungarian singer? Wikipedia says he's British but his name looks Hungarian..) Anyway this song is really mellow and sounds so summery to us - we can just imagine sitting in a park in Budapest drinking beer and listening to this one. I'm also so happy to learn the word Kalandor cause like kalandor vagyok (I am an adventurer). Thank you Koni for the recommendation!! Thank you István, Aron and Norbert for the recommendation! Why it's awesome: They have talent for days! And she has the lushest voice. It's great to hear this in comparison to the rock - Hungarian singers really can do it all, from heavy metal to traditional folky stuff. It has a real Medieval feel! The only thing I don't like is the high pitched whistly flute thing, but her voice makes up for it. Thank you Réka for the recommendation! Why it's awesome: Firstly I like that the lead singer isn't conventionally 'hot', by that I mean she is totally hot, but in the UK it can be hard to have a musical career if you're not stick thin. (Adele being the exception.) As for the music it's a pretty simple, up-beat, fun pop song and is so catchy, the singer sings really well and hits the notes perfectly. Thank you Toth for the recommendation! Why it's awesome: Love this smokey voice, and how much it reminds me like a Lady Gaga/ Nightwish mix-up! It's a very powerful song and I like how high the singer goes. Video's super awesome too. Thank you to Zoli for the recommendation! 7. Paddy and the Rats - "Pilgrim on the Road"
Why it's awesome: This one gets an honourable mention, generally we don't listen to Hungarian music that's in English - because we're not just listening to Hungarian music because it's great, we're listening to it to learn Hungarian. But Paddy and the Rats have to be mentioned because they are great, I didn't expect a Hungarian Irish punk rock band to work, but it does. Thank you Richárd for the recommendation! Why it's awesome: This is a beautiful song. We like it though because it's slow and repetitive - the best type of music for learning a language, listen to it once and you'll never forget how to say Kedvesem (you'll also probably never get it out of your head). This was Hungary's entry in 2013 and apparently Germany gave it top marks! Thank you Norbert for the recommendation! Why it's awesome: Firstly, I like that this song kind of reminds me of Queen. Secondly, I'll like any Hungarian song where I can recognise a single word - and I heard szeretlek (I love you) yey. After listening to it I now know Homok (sand) too, I hope he's singing about how much he loves sand. Thank you for the recommendation Henrik! 10. Queen "Tavaszi szél vizet áraszt" - Spring Wind Flows Water? Why it's awesome: Speaking of Queen... We had a Hungarian singer singing in English so how about an English singer singing in Hungarian? And what better English artist than Queen? Freddie Mercury sings a Hungarian song here - admittedly he reads bits of it off his hand, but my Hungarian friend tells me his Hungarian is "pretty good actually, English accent but understandable". If that's not #goals then frankly I'm not sure what is. Why it's awesome: I LOVE the Eastern vibe to this one and his voice. The song is really haunting and very beautiful. I don't really understand any of it, I assume it's about origins. Is it Christmas yet? I wrote a Christmas edition of this blog post: Best Hungarian Christmas Music, check it out! Last but not least, if you're listening to Hungarian music, you'll need some good speakers, I also recommend grabbing this Hungarian beginner course book. 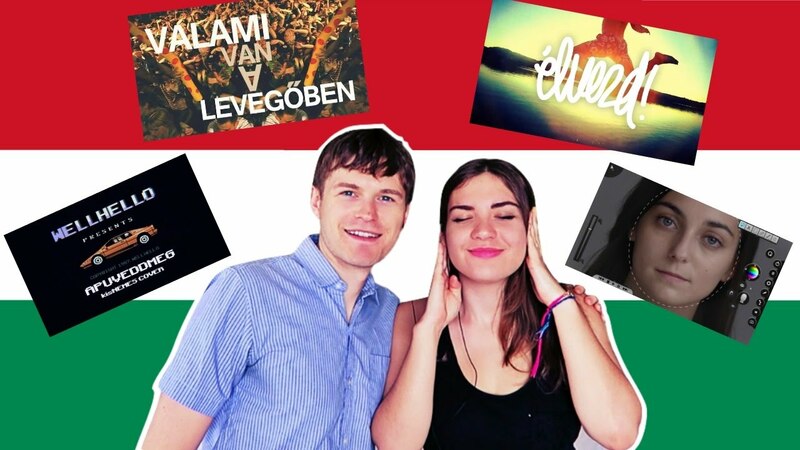 Which Hungarian songs do you recommend we listen to next? Drop us a comment below!